The Baby Lab is located on the University of Massachusetts Boston campus. 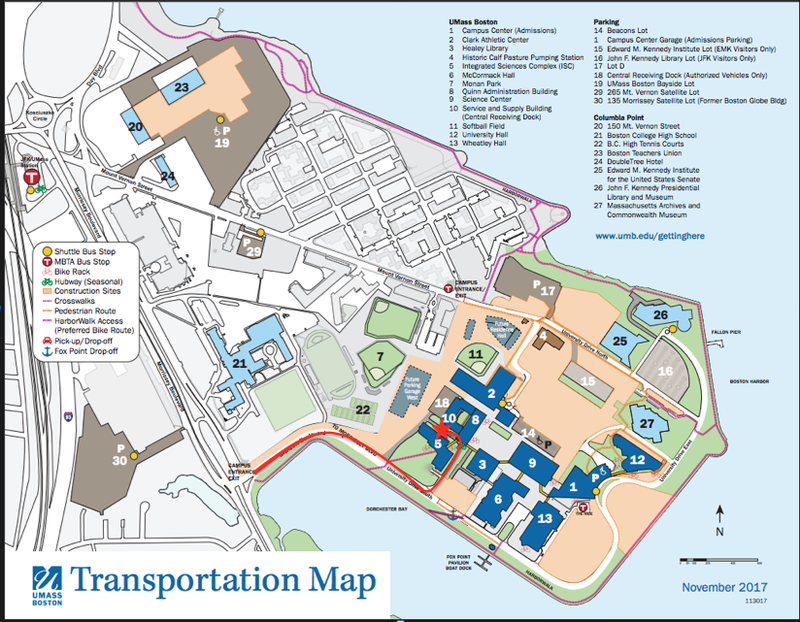 UMASS Boston is located near I-93, 4 miles south of Downtown Boston, near the JFK Museum and Library. Take the Red Line to the UMass/JFK station. When you exit the station, the bus stop for the free campus shuttle bus (#1 Shuttle) will be right at the bottom of the stairs. The bus runs every 3-5 minutes and it has only one stop, the Campus Center (large white building). The bus ride from the station is 5-10 minutes. One of our research assistants will be waiting for you at the bus stop and walk you to the lab. Take I-93 South through Boston to exit 15 (JFK Library/South Boston/Dorchester) and follow the University of Massachusetts signs along Columbia Road and Morrissey Boulevard to the campus. Take I-93 North to exit 14 (JFK Library/Morrissey Boulevard) and follow Morrissey Boulevard northward to the campus. We have a reserved parking spot for parents inside the Campus Center parking garage. When you approach the Umass Boston campus on Morrissey Blvd, you will see a large sign that says "University of Massachusetts Boston;" enter the campus here. Once you turn onto campus, continue straight on the road. You will reach a traffic circle where you can see the water on your right and a number of other buildings to your left. Take the first exit off the traffic circle and pass the Integrated Science Complex (the new, L-shaped building with large glass windows on your left) and continue driving on University Drive. The road will veer left at the end of the peninsula with the water on your right hand side. You will pass two glass buildings (The Campus Center and University Hall). After you have passed the second of these buildings (University Hall) take the second of two lefts. Follow this road until you pass the Massachusetts Archives. Take the left hand turn that comes immediately after the Massachusetts Archives. Continue driving straight until you reach the entrance of the Campus Center Parking Garage. When you approach the UMass Boston campus on Morrissey Blvd., you will see a large sign that says "University of Massachusetts Boston"; enter the campus here. You will reach a traffic circle where you can see the water on your right and a number of other buildings to your left. Take the first exit off the traffic circle and take the first left to ISC (building with large glass windows) where you will see a sign with the text: "DROP OFF, PICK UP AREA”. Instead of turning left into the circular area, proceed slowly over bump in road, straight ahead and then take a left. Continue following the path where you will see a parking lot on your right. Our parking spot will be the very first one with the sign --“Reserved Parking Baby Lab.” Park here and a research assistant with a name tag and a clipboard will meet you to walk you to our lab!